The October flight of flavors currently at Ruby Jewel's. We've been pretty lucky this Fall to have such beautiful sunny days. And what's better to celebrate the autumn sunshine than with October-inspired ice cream? Let's keep the spirit of summer alive as long as we can. 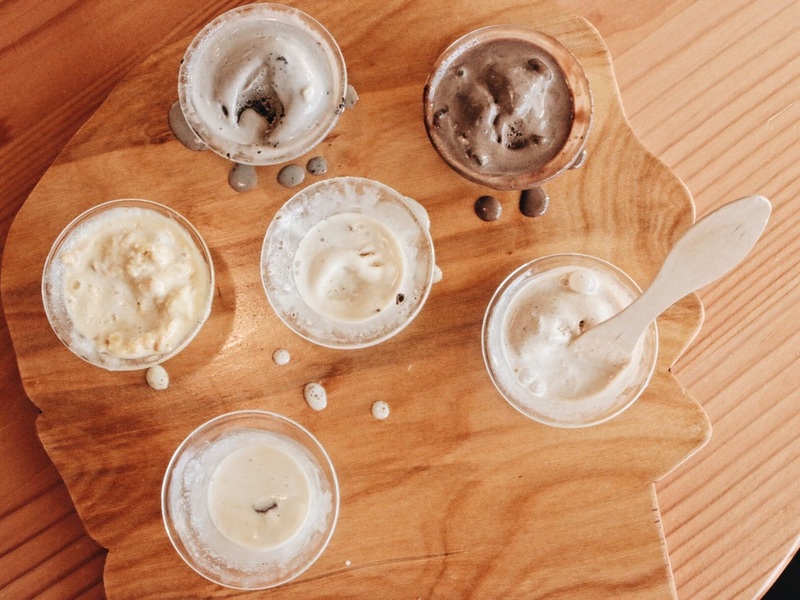 One of Portland's favorite ice cream shops, Ruby Jewel, is scooping up tasty flavors reminiscent of the season and, naturally, The Paper Airplane flew over to the newest location on SE Hawthorne to investigate. Located in modern The Hawthorne building, the latest edition to the Ruby Jewel family is a neat and sweet scoop shop with friendly service and unique flavors. It's a fun space to grab a fresh waffle cone or an ice cream flight to share with friends. What I love about Ruby Jewel's ice cream is its rich consistency and the subtle, new twists on classic flavors. 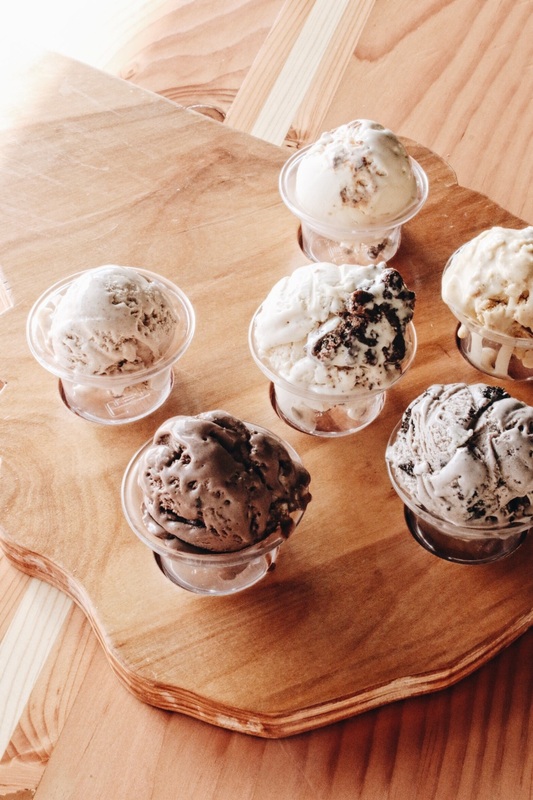 Ruby Jewel prides itself on supporting the local community and economy through utilizing only the best of the best ingredients found in Oregon and the Pacific Northwest for it's one-of-a-kind artisinal ice cream. This month, the Ruby Jewel is also featuring a lineup of seriously delicious seasonal flavors. While taste testing, I made a new friend who eagerly answered a few questions for me on the popularity of Ruby Jewel's October flavors for those under 8 years-old. She was very curious as to why I had an entire flight of ice cream to myself and had lots of expert opinions on which flavors I should write about, including but not limited to the new Pumpkin Pie flavor. Me: "You seem like an ice cream expert?" Me: "If you could pick any flavor, which one would you write about?" Me: "What's your favorite thing about Pumpkin Pie?" I will confirm for those over the age of eight that, yes, Pumpkin Pie is really good. The flavor is incredibly natural as if eating a homemade pie reincarnated in ice cream cone form-- and not at all like Pumpkin Spice this or that. Plus, there were flaky pieces of pie crust interwoven. In my humble opinion it was so much better than actual pie. All of the October flavors are equally tasty in their own right. Seely Mint Cookies & Cream is like a refreshing peppermint Oreo, Red Ape Cinnamon tastes just like Grandma's snickerdoodle cookies, then there's decadent Chocolate and Candied Orange, rich Peanut Butter Krispy Crunch and Candy Bar Explosion (awesomely self-explanatory.) With flavors this good, you can't go wrong. Forget the candy this Halloween. I'll take a pint of Ruby Jewel, please. Note: Thank you to Ruby Jewel for the super sweet taste test! Dear readers, as always, all thoughts and words are all mine.